For actors that are new to the industry, and even those with years of experience, auditioning can be a daunting experience and one that is filled with fear and judgement which in turn creates audition mistakes. As actors, we go into the room hoping to book a job and be “good enough“. We want the auditions and whilst part of us is excited to get the opportunity – we are fearful that we aren’t ready and our agents and managers will drop us if we don’t book, or we aren’t memorized, or don’t understand what they will want from us. Or, maybe we can’t get an agent or a manager as we haven’t booked a job yet. Either way we are filled with self-doubt and the process can be stressful or, for some, panic inducing. Of course, you should be in an acting class that enables you work these “muscles” a couple of times a week – the actors that book mostly are the ones that are consistently training and understand that the training part never really ends, it is a constant journey. But before you find the best acting classes in Los Angeles or wherever you are in the world – here are some quick and easy tips to help you through this process and find your power in auditioning before you get into the room. Casting Directors have to see vast amounts of people during the day, they do not need you to shake their hand or ask them too many questions or make jokes – or try to engage too much. It actually makes you look desperate and needy. They want you to be relaxed and confident in whatever it is you have created. Understand where the camera is and where they will film you, other than that there should be no need to ask too many questions. Be friendly – but don’t take over their space. Decide for yourself whether you are standing or sitting – but be prepared and open for them to change it. This is your space and your moment to do what you can with this particular character. Don’t ask for permission, they want you to go for it. 3. Know your first line. If you are going to memorize anything, make sure you know your first line and have a thought about where you are coming from. This is far more important than most people realize. It also indicates that you know you are in the middle of life – not just doing a ‘scene’. What has happened before this moment? It is important to have thoughts, not just speak a line of dialogue. Even saying “Hello” as your first line, how much thoughts go into your head about the other person? How long since I last saw them? How was the last time we spoke? Are we close? are we fighting? Did they hurt me? Did I hurt them? So many things thoughts should be flowing through our minds before we even utter a word. 4. Don’t assume you know what they want. Don’t try to make a decision about what Casting Directors or Directors want from you. The truth is, they don’t always know until they see it. They want you to create a life and be open to direction. If you are trying to play an idea of a character, it will not work for you. this is what happens when people memorize their lines too quickly – they close themselves off from their imagination and “box” themselves into an idea. You also need to be able to take direction and that comes with understanding the character you have created and allowing the relationship to guide you. They may ask you to do it a different way, this should be a simple adjustment and not require any further questions. So at home PLAY. You must be able to offer different choices. If you haven’t opened up your mind to different interpretations then you may find this difficult! 5. Use your nerves and anxiety to “feed” you. Everyone is nervous and filled with fear about auditions. The word audition creates fear and panic in many people. Why – because we feel judged. Instead of letting your fear control you, use it to help you in the life of the character. How does this person use their nerves? Could this person be nervous in the situation they are in? Calm your fears by realizing at auditions there is always someone before you and then someone after you. This isn’t just YOUR chance. You have a chance. But it isn’t your only shot. Its the same for everyone. So walk in relax and offer your version. Own it. Walk out and on to the next! Audition mistakes happen don’t let it control you. 6. Stay in it – until they stop you. One thing that indicates to a Casting Director that you are “green” and very new to auditioning is when you look to the camera as soon as you have said your last line. Allow yourself time to have thoughts at the “end” – they will tell you when they have cut. It is not our job to say the “scene” has finished. Don’t rush it, stay in the ‘life’ as long as you can and wait for them to indicate they have seen enough. Slating is something that actors struggle with a lot. They go into the room, filled with ideas and thoughts about the character and what they plan to do and then they get asked to ‘slate’ – say your name to the camera – before doing anything else. They then get completely thrown and lose what they were doing. Slates are one of the things you need to get used to. Audition mistakes happen when you try to get into the character AFTER slating, instead of putting the character ‘in your pocket’ for a moment. Ask yourself, if you were playing a serial killer – would that serial killer not try to hide? So, the slating part is just a moment of hiding (covering) that we all do every day. It’s not something separate from the life. It’s very important to do all your creation outside of the room and then if you have done it specifically, it will stay with you for the whole audition – even when you’re not in the “scene”. Yes, the audition room is a strange place, and sometimes with any number of strangers watching us – and naturally this fills many of us with anxiety and fear. Something you can do to help with this is by using your environment effectively. We can tell our brains anything and if we are truly connected we will believe it. For instance, imagine you are auditioning for the role of a lawyer. Let’s say this person has a big court case and has to deliver her closing arguments. The people in the room become the jury, the attorneys, the judge. If we can do this quickly without judging ourselves. Auditioning becomes easier and more fun. And the less audition mistakes you will make but never make that the goal! 9. Mistakes are your friend. We all want the audition to be perfect and for us to get everything “right” but the truth is sometimes that means it looks and feels too planned. If you make a audition mistakes and miss a line, or say the line wrong don’t stop and apologize and make them have to start again. They mostly don’t care – Just breathe and pick up the line again – you should never apologize for making “mistakes” in life, we make them all the time! So be fearless don’t worry about audition mistakes. Always remember relationship guides us. A lot of acting mistakes occur when we are in our own head and being a technical actor, we sometimes forget the person we are talking to. Whoever is reading with you – whether that is another actor, or the Casting Director – use them as the other person, be affected by them. “Take a dance with them” … you never know where it will lead. This makes us spontaneous and interesting to watch. Now go and enjoy your next audition! It wont be the last so take your time and really experience living the life of another person! Audition mistakes happen but don’t be afraid to make them! Here are some steps to follow before every audition check them out here! 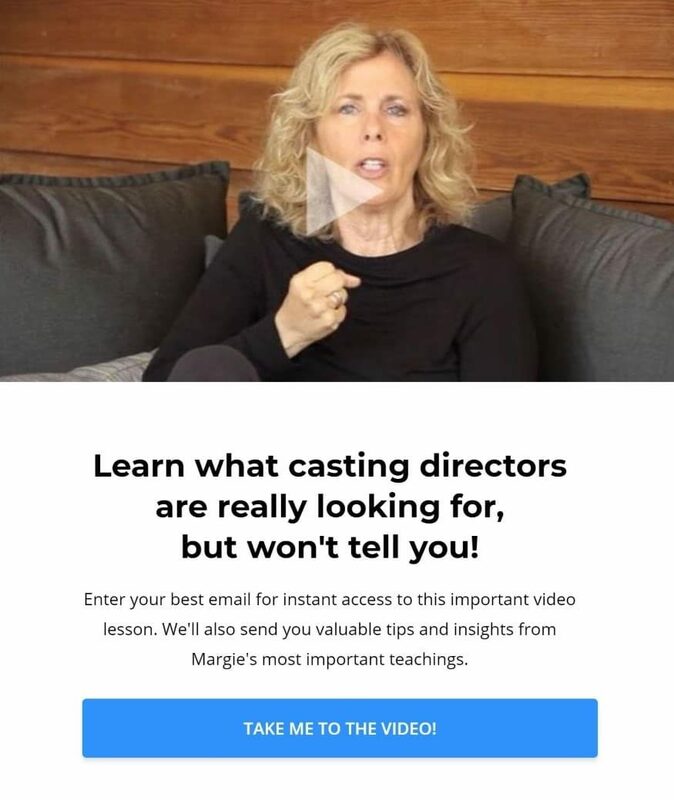 And check out Margie on Youtube!